Fully secured shopping cart maintained by DiskTrix. 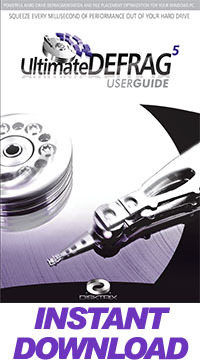 UltimateDefrag5 is available by instant download. Each license allows use on three Windows devices. To install on more than 3 computers, please order multiple licenses. You'll save on each license when you order multiple licenses. When you order, you will receive your license number(s) by e-mail. Then use your license number to activate UltimateDefrag5, which you can download from here. See below the pricing table for other terms and conditions. To order, CLICK HERE TO GO TO THE ORDERING PAGE, Add to cart and adjust your license number quantities. You do not need to create an account to complete your order however creating an account will give you convenient access to your license numbers at a later date. If you decide at any time, within 30 days of purchase that your DiskTrix product isn't for you, uninstall your product then contact us and let us know (and request a refund) and we will issue a refund - no questions asked. When you purchase your license is permanent for that version e.g. V5 and you receive free minor version updates. There are no recurring annual fees to pay. When we release a new major version (about once every 2 years) you will receive a 40% discount on the new major version or you can keep using the previous version permanently. © 2010 - 2019 DiskTrix Inc. All rights reserved.